Started the show off with a track from the Ghoul Night Out collection LP that you can grab yourself a copy from via the Sorry State Records website or your favorite distro of choice. 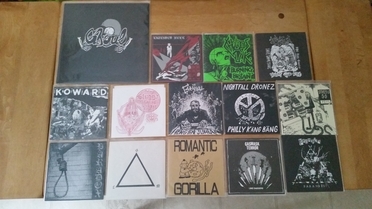 After that and another track from the Extended Hell EP that Brain Solvent Propaganda recently released, I started playing songs from random 7 inches that I have in tiny milk crates all over my house. Thanks for listening! 2.) Extended Hell - "Armchair Killers"
3.) Chaos UK - "Four Minute Warning"
4.) Nightfall - "Bloody Death Dealers"
6.) Gasmask Terror - "Dead End"
7.) Stress SS - "Personlighetens Seger"
8.) Romantic Gorilla - "Congratulation"
9.) Glam - "Duelo de Titanes"
12.) The Carnival - "Henki-Mieli-Liha"
14.) Zatsuon - "Life End"